If you do not see the school badges at the top of the screen then click on www.sths.org.uk to get a clean entrance to the site. The close harmony treble sound of the Libera choir's massed boy voices is like a Stanfield Prize Day choir rather than a church choir. 6th February 2014 Windows 7 Internet Explorer 11 does not handle Find Menu name clicks. Use the Find Menu Search function - then click on the highlighted name entry. If you were a pupil or a teacher at Stanfield Technical High School, Stanfield County Technical School or the Junior Technical School in Burslem you will find lots of memorabilia here to interest you. Whether you are interested in the school history or wondering what the school looks like now you should be able to find a few things to remember. We have all the known panoramic school photos, from 1955 to 1970 on this site. N.B. Please be patient while these photos download; it may take 2-3 minutes to download the whole photo on slow connections. 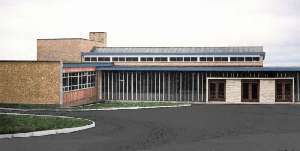 There was a 70th Anniversary Reunion at the High Lane School on 20th September 2002, and the pictures are here. Thanks to Ray Reynolds, David Moore and the staff and pupils of Haywood High school for making the event a success. There are some recent pictures of the school and we have a substantial amount of information on the old school buildings in Moorland Road. If you want to remember the local geography there is a 1960's Map of Stanfield School area. Stanfield Technical High became Stanfield High School mixed Comprehensive in 1971 and later became Haywood High School (circa 1985). There is a Facebook page for the Stanfield High School comprehensive. See also the School History for the details. I'd like to thank the many helpers who have already contributed information to this site. This is the site history so far. Keep it coming! The Contents Page lists a whole host of photographs and items that have been submittted by the numerous contributors to this site. If you have anything of interest over the period 1932-1972 to contribute to this site please let me know.